1943 R302-1 M.P. & Co.
About a week ago, while searching eBay for Poor Old Baseball Cards, I saw a 1940 Playball Joe DiMaggio that was in horrible shape. It had a low starting bid and a few days before the auction ended. So I waited. And waited. And waited. On the final day, the price was still low. Somewhere around $10 if I recall. I knew there was no way it would go for anywhere close to $10 and I had to get to work so I can earn money to buy all these POBCs. I put in my best bid. It was more than I wanted to bid, but I typed it in ... $110. I was not a winner. The card ended up selling for $132. More than I was willing to spend. I never thought "Joltin Joe" would ever be a part of my collection. He didn't appear in very many issues after all. A new search revealed this card. Produced by Michael Pressner Company of New York in 1943, it was a card of DiMaggio during his playing days. It was also produced during World War II. I wanted it. It was old. It had rounded corners and deep creases. It had writing. It was perfect. By the way, that's a "CF" written in blue ink: Center field. That's the position Dimaggio played. But you woldn't know it by looking at the card's reverse. It lists him as a rightfielder. One more thing, I got this card at a steal. A real Joe DiMaggio, are you kidding me? $40. I posted this same card several months ago. It used to look like this. But a week or so ago, my chihuahua/pug mix decided it looked more like an appetizer. 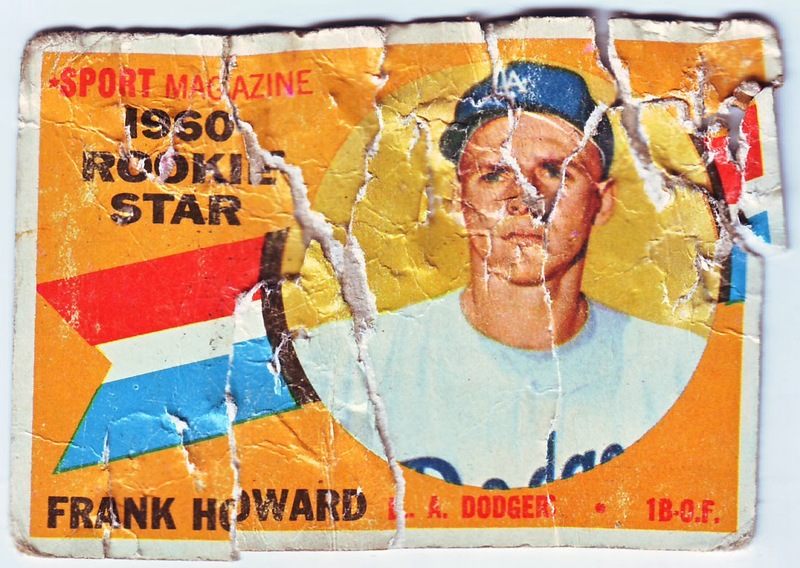 When I first saw the card in no less than nine pieces, I was hoping: Don't let it be Mickey Mantle. Don't let it be Mickey Mantle. Don't let it be Mickey Mantle. It wasn't. But it was sad to see Frank Howard in distress. I quickly picked up the pieces and put them aside. I thought it was beyond repair. Tonight I figured, with the help of some transparent tape, I'd put it back together. And from what I can tell, I think it's all there. I think I dodged a bullet. Lesson learned.